Can Acronis TI 2017 back up to a Thunderbolt 3 device under Windows 10 64 bit? Acronis TI 2017 are there any problems backing up to a Thunderbolt 3 device under Windows 10 64 bit? Alan, there shouldn't be any problems with backing up to a Thunderbolt 3 device from within Windows 10 as Acronis will use the device drivers provided within the OS to know how to access / write to the device. What may be more of a challenge is recovering your backup from the same device using the Acronis Rescue Media where you would need to check that your Thunderbolt 3 device is recognised by the media when booted. This again shouldn't be an issue with the Windows PE version of the Rescue Media that can be created with ATIH 2017 for Windows. You would need one of the people with Mac experience to speak to doing this from ATIH 2017 for Mac. I have tried using Acronis Rescue Media 2018 with a Thunderbolt-3 devices. It does NOT see the device which indicates to me that Acronis has not included the Thunderbolt-3 driver in their Windows PE bootable rescue media. Robert, please consider using the MVP Custom ATIPE Builder script (link below) which will allow you to include device drivers from your computer or else to add extra drivers as needed. In the hope that my comments will help others avoid the DAYS of research and "pain" associated with getting this to work, I'll post my results. It really bugged me that the Acronis documentation offered absolutely NO HELP. Neither did Acronis support. The official Acronis hardware support URL lists Thunderbolt as supported, and it works quite well ONLINE. However, you're stuck if you need to restore your backup OFFLINE! Using the MVP Custom ATIPE Builder worked but only after a lot of effort. First, I had to locate the appropriate Intel Thunderbolt-3 drivers. Do NOT go to the Intel website. These drivers are vendor-specific. I copied the "Thunderbolt" folder that I found on the install media from the PC Vendor. In this case, it was an HP EliteBook 850 G5. The "Thunderbolt" folder was under the "Intel" folder at the root of the install media. Copy this ENTIRE folder (there are two important drivers, .inf files, and other files) to the "Drivers_Custom" folder under "MVP_ATIPEBuilder_v182". Run the builder utility and make sure to select the "inject custom drivers" option. VERY IMPORTANT NOTES: You're still not done! You have to enter the BIOS on the PC and disable Thunderbolt Security before the Acronis Windows PE was able to see the Thunderbolt-3 drive connected to the PC. On the HP PC, it was in the BIOS settings under "Advanced > Port Options". I had to UNCHECK the box "Require BIOS PW to change Thunderbolt Security". 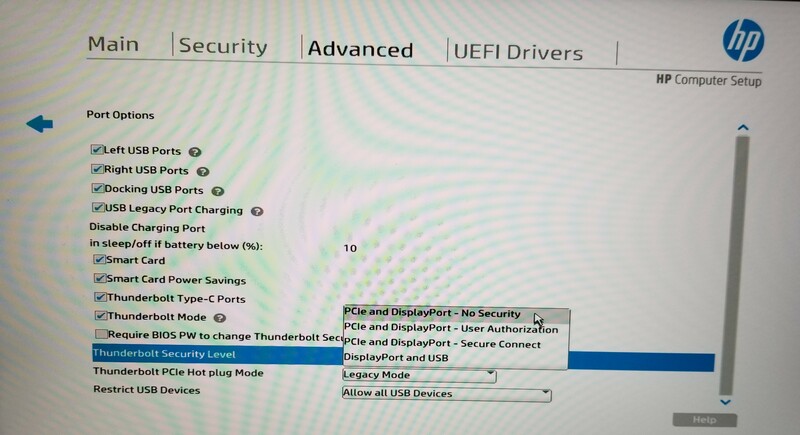 Select "PCIe and DisplayPort - No Security". Now, I could see the Thunderbolt-3 drive both in the Boot Options and also in the Acronis bootable CUSTOM Windows PE. Finally, I was able to use the bootable "Acronis/Tools/Clone Disk" to clone the original 512 GB PCIe SSD onto a 1 TB PCIe SSD. Robert, thank you for sharing your solution to getting this to work.